We live in a era which we can share information at an amazing speed. Bytes go through a server to another. We can store a huge amount information and share with each other to know a little bit each time we read something new. We live in a era when you can study whatever you want because of the free access to the information. Do you want to become a computer scientist while studying a major in physics? Why not? We live in a era which most of the people navigates with a fair bandwidth. We don’t wait a high time in a queue to access somewhere, it’s almost instant. How do you feel to be back at the old times when internet was at 56Kbps? I’m sure you can’t play insert-here-your-favourite-online-game without lag or watch content in HD with that speed, can you? And I’m sure you don’t want to pay more for a service that it’s not cheap, to say the least. We live in a era where online and media content is at our disposal. Where we can watch movies and TV shows and a lot of YouTube and Vimeo videos without any limit. 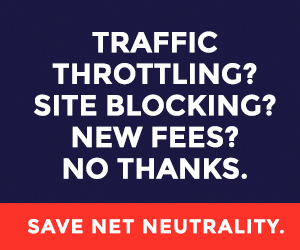 So, yeah, you should be worried about Net neutrality. You should be worried because it represents a freedom in the internet that allow us, as individuals, to have access to a whole new world of knowledge. Where we can express, like I do, in a blog, or social media, or whatever you want. Where new companies are born every minute and can reach us to offer new products and people and innovation are met. Where people meets and do stuff keeping the internet alive. Where we make the weird stuff. Do you want that an ISPs can control whatever you do online? Throttle your speed? Keeping an eye so they can control how many videos you saw? I’m not a US citizen, but I strongly support the Net neutrality as an EU member. And at the 12th july, I want to be a part of the Net neutrality protest. 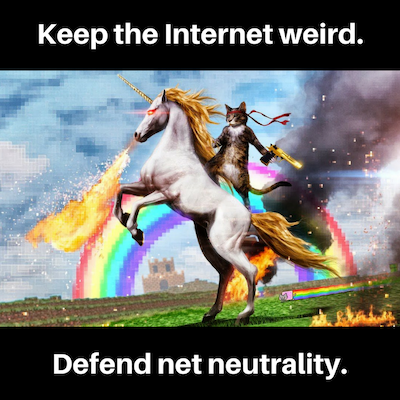 I don’t know if companies stand for that because of business or because they really believe in this, and I don’t really care, because at least there’re a bunch of them, and you can see through the BattleForTheNet.com Participants. Are you an US citizen? Please do something and tell Congress & FCC you support the Net neutrality before it’s too late! You can do it by sending a letter to FCC & Congress.